How Many Casinos Operate In Southernmost Illinois? There’s more pressure than ever on local authorities and legislative bodies to expand casino gambling in Illinois. It’s a controversial issue because opponents of the practice believe it results in government corruption, addictive behavioral issues, higher crime, and a “regressive tax” on those in poverty. It’s also a restricted industry across the United States, but local economies often benefit from tax revenue generated by gambling, and so governments still continue to allow certain types of gambling. In Illinois, all casino gambling is conducted aboard riverboats (sort of), seven of which are docked boats that don’t actually go out onto the river. Three of the other casinos are technically operating on land, but they get away with qualifying as riverboat casinos because their foundations were built in pits filled with only a couple inches of water. Loopholes at their finest. Those ten casinos are the only ones in all of Illinois, and the limit stays capped at ten. Only three of these casinos operate in southernmost Illinois. They’re a little bit different from the casinos to which you may be accustomed. You can’t smoke indoors, and they don’t stay open around the clock. On top of that–and maybe worst of all!–bartenders won’t give you free drinks just for playing a game of blackjack or yanking the handle on a slot machine a few times. Free drinks at casinos are illegal. You must be 21 in order to drink, as usual. Plus, there are records that lend transparency to casino gambling in Illinois. All records for payback rates of electronic game machines are reported to the public, and you can easily find statistics online. 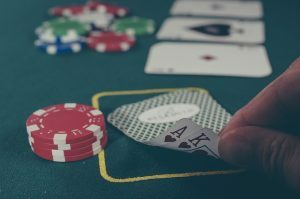 Most casinos will offer the fundamentals: poker, Mississippi stud, four card poker, Ultimate Texas hold ‘em, let it ride, three card poker, roulette, craps, and blackjack. There’s more, depending on the casino. Riverboat gambling was first implemented in 1990 after the Riverboat Gambling Act was put into law. It was the second state to implement such a law. A newer “Video Gaming Act” was put into law in July 2009, and authorizes retail establishments to place a maximum of five video gaming terminals. These terminals are regularly monitored by the Central Communications System. The casinos are regulated through a five-member Illinois Gaming Board to maintain the integrity of the industry.